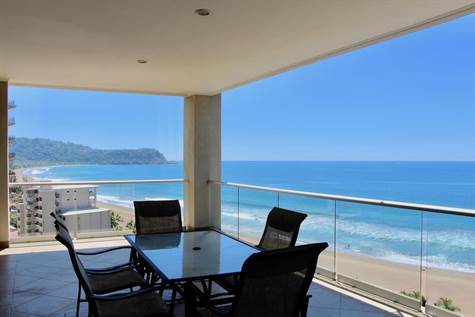 "AMAZING OCEAN & CITY VIEWS"
Breakwater Point Condominium is located on the more secluded and pristine north part of Jaco Beach with unique views of the, ocean, estuary and tropical rainforest. This luxurious 14th floor residence has 2 bedrooms 2 baths with gourmet kitchen, granite countertops and top of the line appliances. The oversized covered terrace is ideal for enjoying the ocean breezes, evening sunsets and outdoor entertaining. Breakwater Point is a very desirable community with 44 residences, and the lowest HOA fees at just $345 per month. Ideally located just a short walk to Jaco and Croc´s Casino Resort where you have access to a casino, restaurants, day spa, coffee shop and convenience store.